THE recent brouhaha involving Senators Benigno "Noynoy" Aquino and Joker "The Joke" Arroyo could have been avoided if the latter actually batted for the creation of two, not just one additional district in Camarines Sur. It's too obvious that the proposal is meant to accommodate Rep. Dato Arroyo, the president's youngest son, and Budget Secretary Nonoy Andaya, previous occupant of the former's current post who is planning to reclaim it in 2010. 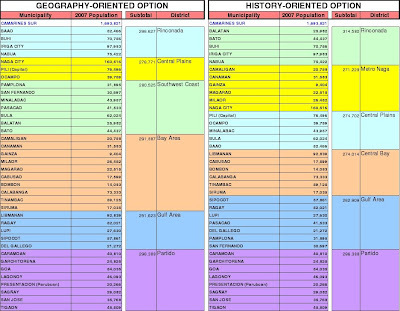 If The Joke only bothered to check, Camarines Sur is already entitled to six districts, on the strength of its 1.69 million population as of August 2007 -- about 140,000 higher than the 2000 figures but a tad lower than what I projected here. But when he called up the NSO regional office, according to people there who met us potential users of the planned 2010 Census on Population and Housing (CPH) this morning in Legazpi City, Senator Arroyo was only asking about a fifth district. He could have told Noynoy why he is so interested about Camarines Sur: the sixth district, if it materializes, is where he plans to run after being term-limited in the Senate. Which got me thinking: what are the other possible configurations of Cam Sur's two additional districts now that we already have the official count? I came up with two, shown after the jump. Welcome back! The image is very small, can't read it.